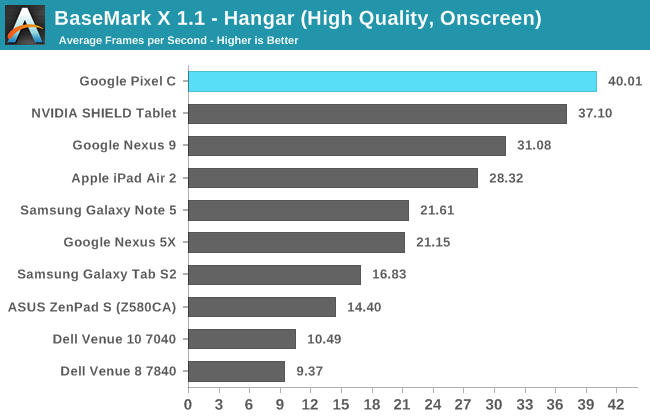 Even to this day, Tegra K1 has held the crown for best GPU performance in a mobile Android device. From one point of view this is quite impressive, as it shows how NVIDIA was able to build a GPU that no other SoC vendor apart from Apple was able to beat. From another point of view, it's quite concerning to see that nobody apart from Apple values GPU performance enough to try and beat NVIDIA's chips. Being an NVIDIA SoC, Tegra X1 is paired with a GPU designed in-house by NVIDIA. More specifically, it’s a 256 core part based on their Maxwell architecture. 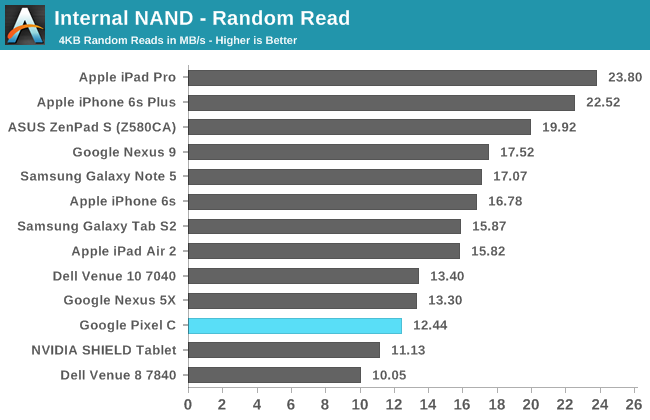 We’ve already seen how this GPU performs in the SHIELD Android TV, but due to being battery powered and having stricter thermal constraints, there will obviously be differences in performance between it and the Pixel C. In this case, it appears that the GPU is also running at a lower frequency than the SHIELD Android TV. While it has been estimated that the SHIELD Android TV's version has a peak GPU frequency of 1GHz, I believe the implementation used in the Pixel C has a peak GPU clock of approximately 850MHz. It’s also worth noting that the Pixel C uses the open source Nouveau kernel drivers that differ from NVIDIA’s kernel drivers on the SHIELD Android TV and SHIELD Tablet K1, and it doesn’t have full OpenGL support which has been the case with Google’s previous Tegra-powered devices as well. 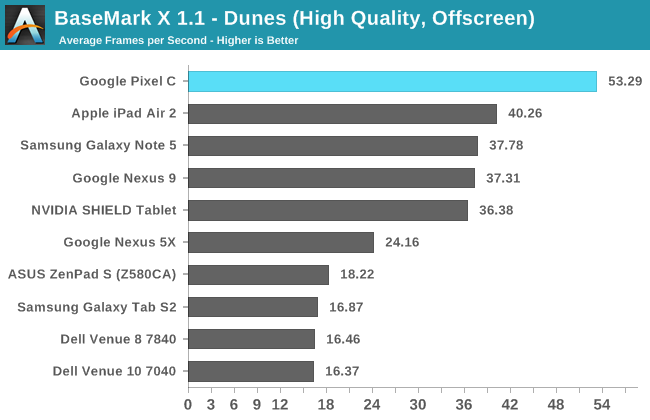 With all that in mind, lets dive into our standard mobile GPU test suite to evaluate the GPU performance of the Pixel C.
There's not a whole lot to be said about the Pixel C's performance in BaseMark X beyond saying that it's faster than any other Android device by a large margin. 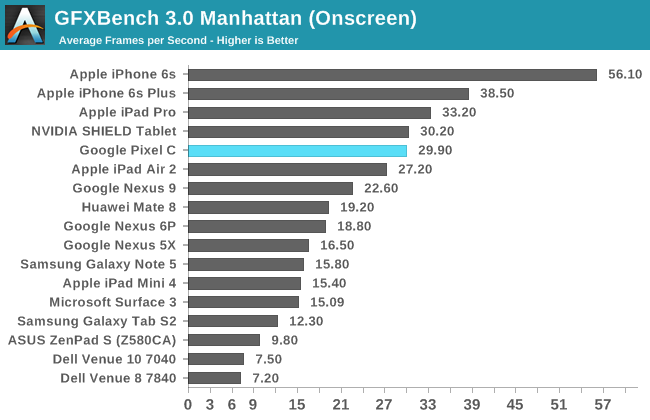 Even in the on screen tests, the Pixel C with its substantial resolution is still the fastest device on the charts. 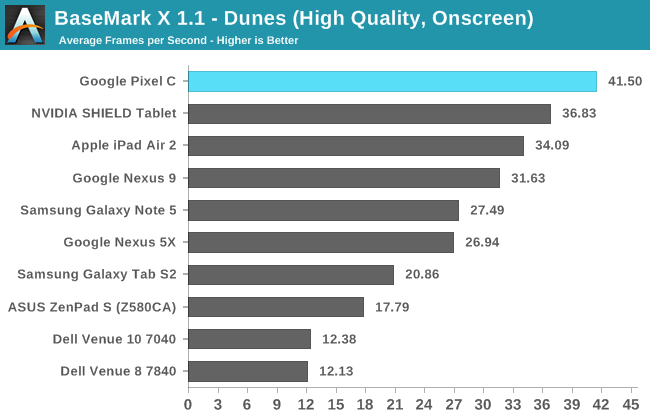 Absolute GPU performance as shown in the off screen tests shows a 43% performance improvement over the Tegra K1 used in the Nexus 9. 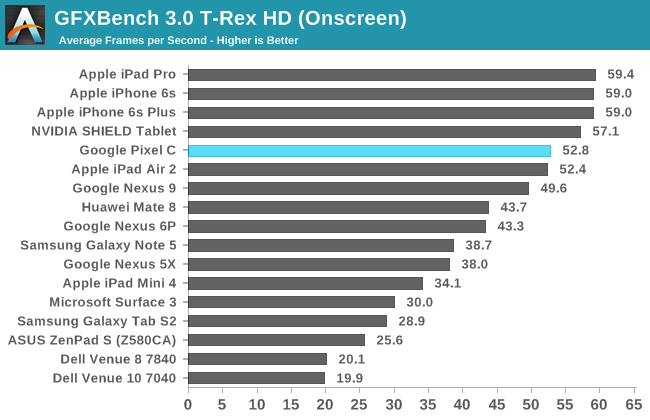 In GFXBench's T-Rex on screen test the Pixel C comes very close to hitting the Vsync limit despite its relatively high resolution. 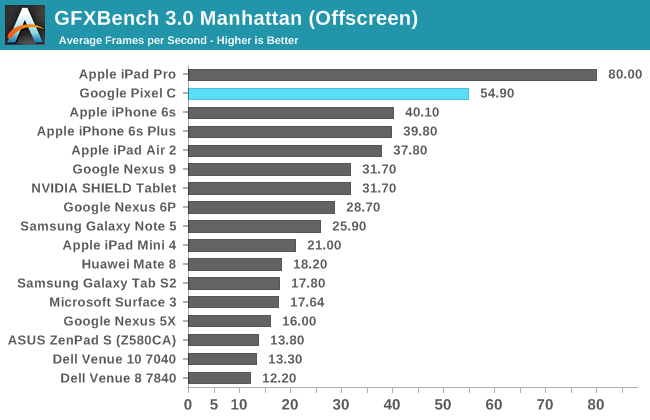 Off screen performance in both T-Rex and Manhattan is exceptional, and both tests make it clear that the Pixel C has the most powerful GPU in any mobile Android device. 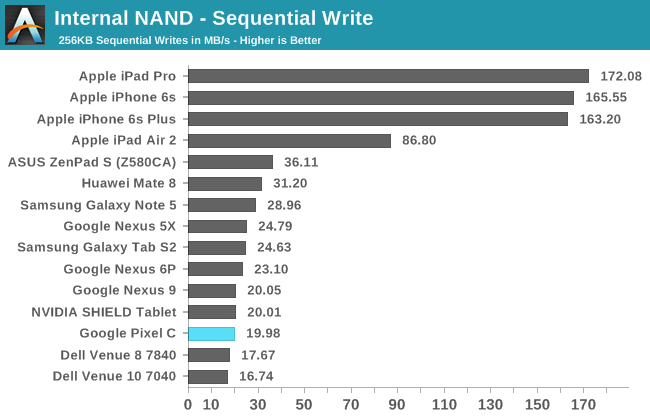 The gap between it and the next fastest device is quite large too, and the only tablet that can beat it is the iPad Pro with its A9X SoC. 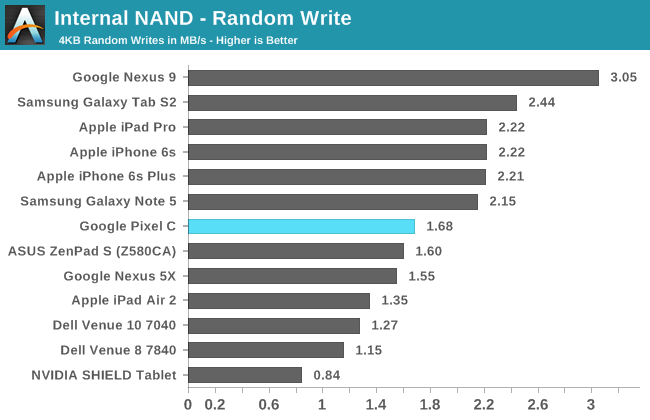 The GPU performance of the Pixel C is unparalleled in the Android space. Not only that, but it ends up being faster than any similarly sized tablet, including the iPad Air 2 and of course the Nexus 9. It’s certainly impressive, and while I don’t mean to take away from the achievement, I can’t help but wishing that we had seen Tegra X1 come to market a bit sooner. Beating out A8X and Tegra K1 is great, but the former of those SoCs is also now well over one year old. 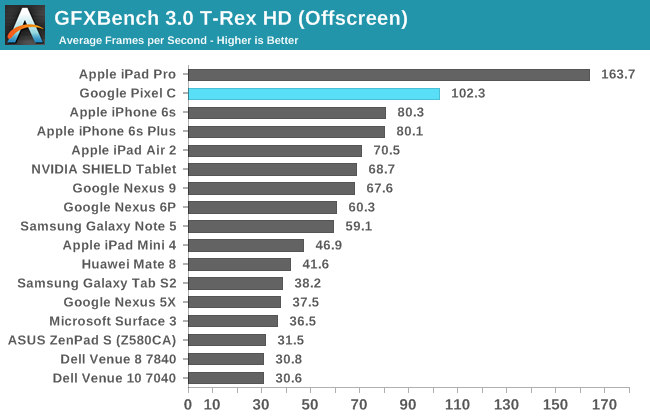 While comparing to the iPad Pro is unfair in some respects due to the size difference, both devices do sell themselves as tablets priced for productivity, both launched at around the same, and NVIDIA’s GPU isn't as fast as the one in A9X. That being said, at $799 the iPad Pro is also significantly more expensive than the Pixel C, and relative to its price the Pixel C offers amazing GPU performance. The only concern would be if A9X shows up in some sort of regular sized iPad priced at the same level as the Pixel C. While I certainly do wish we could have seen Tegra X1 in some sort of tablet a bit earlier in the year, right now it does stand as the chip with the fastest GPU to ship in a standard size tablet, and I don’t think it will disappoint even when playing the most intensive 3D games. Something that hasn't been investigated very thoroughly in the past is smartphone storage performance. However, among high end devices this is now becoming a point of differentiation. Apple has moved to their own storage solutions that use NVMe and run over PCIe, while Samsung is pushing forward with UFS 2.0. While the Pixel C is a premium tablet, it ships with a standard eMMC storage solution. It also has Google's disk encryption enabled, which has been shown to impact storage performance in the past. Like every Android device that Google has been involved in developing, the Pixel C doesn't fare well with our storage performance tests. 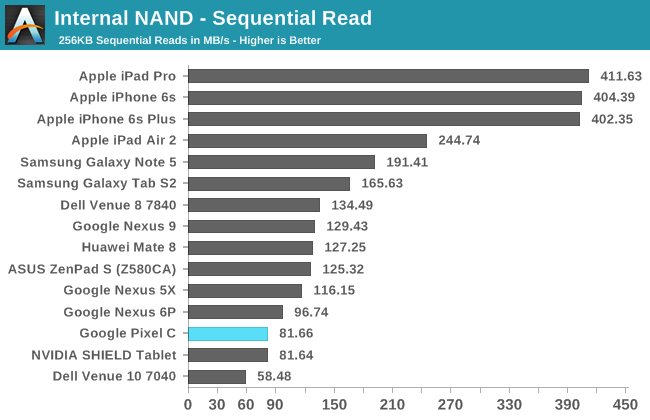 Random reads and writes decent, although not competitive with new storage solutions like the SSD in the iPhone 6s and iPad Pro. Sequential speeds are simply not good at all, and definitely not competitive with what you'll get in an Apple device from the past two years or anything with an unencumbered and halfway decent eMMC or UFS storage solution. There's not much point in going over this issue again, because at this point it's clear that Google doesn't consider storage performance to be a metric worth competing on. I think it is, and I think that users end up appreciating the benefits of faster storage through quicker app installations, less loading when working with large files, among other benefits, even if they don't know what's driving those improvements behind the scenes. It's definitely something to think about when considering the Pixel C as a tablet, especially if you have a productivity focus.